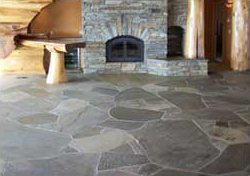 Arizona is a stone that is available in Buckskin, Rosa, Classic Oak, Peach, Chocolate and Moss flagstone. They are available in both patio and select grades so that you may choose which size pieces are suitable for your project. 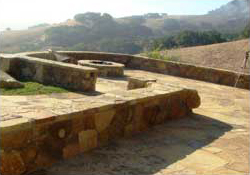 We also carry capstones in 12″, 20″ or 24″ wide by random lengths. The capstone are approx. 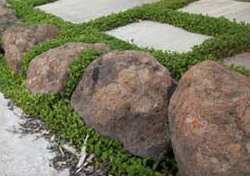 2″ thick and are used for capping a wall, fireplace hearth, pool coping or even a more formal patio or walkway. We also carry the snap cut ledger which can be used to veneer walls, fireplaces, stair risers as well as make for great border or edging material. The Sydney Peak stone has a broad appeal due to it’s striking range of hues that include blue, gray, and gold. The stone is hand-split and graded into different thicknesses as well as size pieces. The Sydney Peak stone is dense and durable which makes it a great candidate for any water application including water features and pools. We carry the Sydney Peak in a variety of forms including flagstone, tumbled flagstone, stepping stone, ledge stone, thin veneer, boulders and slabs. 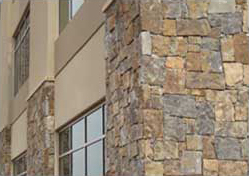 The Pennsylvania Full Color Bluestone consists of a variety of shades and tones. The predominant colors are blues, grays, greens and browns, plus warm tones with interesting rusts & lavender shading. 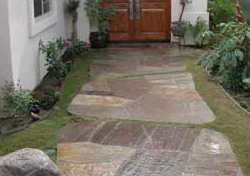 We carry the full color bluestone in both select and tumbled grades of flagstone. The Sweetwater contains rich, variegated colors of tans, browns, chocolates and gold. This desirable variation of earth-tone coloring has lent itself to be a very popular choice. 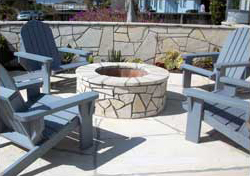 The Sweetwater is available in a few different thicknesses in both patio & select grades as well as a tumbles grade. We also have the Sweetwater in the pencile ledge, snap cut and thin veneer which would all be suitable in a stacked stone application for fireplaces, walls and columns. 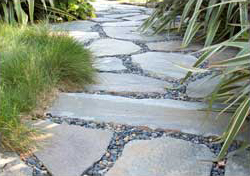 The Sweetwater is also available in large slabs and landscaping boulders. 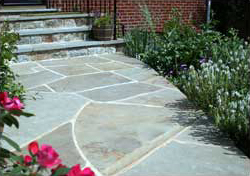 The Monterey Cream is a beautiful cream colored flagstone/ledge stone. It is a hard and dense limestone that we have available in both patio and select grades of flagstone as well as a snap cut ledge stone. The Quartzite’s predominant color range is grey to gold with mica to add some shine. It is a very hard and durable stone that is available in Silver, Sunset Gold, Full Color Range and Sockeye. The Quartzite is available in 3/8″ – 3/4″ thickness which is the thinnest material we have for laying over concrete. We also carry the quartzite in a thicker grade that is suitable for any application not over concrete. Due to the hardness of the quartzite, it is an ideal choice for any application around water. The Stardust is a very hard quartzite with varied shades of gray and gold to brilliant red and mahogany coloring. The Stardust has lower mica content than some of the other quartzite colors so it is not as shiny yet still very durable for use around water. 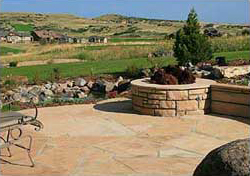 The Stardust is available in both select and patio grades of flagstone as well as a ledger and thin veneer. When weight and space are an issue, our line of thin veneer products are the answer. All of our thin veneer choices have less than 1 1/2″ bed width and weigh less than 15 pounds per square foot. Our thin veneer products have both flats and corners to accomodate any veneer application such as facing on a house, walls, columns or a fireplace. If you are looking for the perfect accent to your landscaping project we have many different types of boulders to choose from in a wide range of sizes as well as several sizes and types of cobbles and pebbles.